Lovingly renovated in the spring of 2016, our 40m ² large, pretty bungalow in a quiet location right on the edge of the forest and overlooks the spa town of Bad Gottleuba. It has a separate ground floor entrance, a fully equipped dining / kitchen with oven and microwave, fridge; and freezer combination and with sufficient storage space. The meals can be taken in a cozy round at the modern dinette. If you want to watch your favorite shows in peace, retire to the separate living room on the comfortable couch. The bedroom can be reached via a spiral wooden staircase in the converted attic, there is enough space for additional human and animal overnight guests. Children can sleep in their own bed in the parents' bedroom. 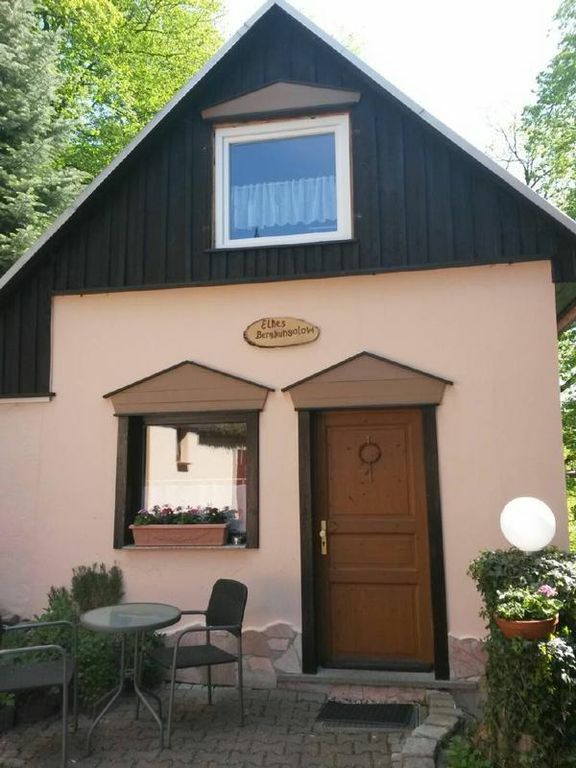 The bungalow is the perfect starting point for hikes through the Eastern Ore Mountains or excursions to the nearby Saxon Switzerland. Especially families with children and pets (dogs, cats) will find here a place to relax, sunbathe or have a barbecue on the terrace. Motorcyclists will also find a hostel here on their tours through Saxon Switzerland and the Czech Republic. For our cyclists / tour guests we offer storage facilities for the wheels, which can be parked safely, dry and protected after interesting and varied trips. Winter sports enthusiasts are recommended to visit the nearby Altenberg; There are also guest rides offered with a bob. The city center of the Moorheilbads Bad Gottleuba and the nearest bus stop can be reached in ten minutes. Nearby there are also a horse farm, the dam Bad Gottleuba, as well as the water park "Billy" and the visitor mine "Marie Louise Stollen" in the climatic health resort Berggießhübel. The median spa clinic Bad Gottleuba is within walking distance in 10 minutes, so the bungalow for family members of the patients is an ideal place to stay. The access road to the A17 is only a five-minute drive away to drive into the beautiful Elbflorenz Dresden. All overnight guests of our double resort will receive the new Common Guest Card Saxon Switzerland. This guest card offers discounts on over 40 leisure facilities. All overnight guests of Bad Berggießhübel receive additional discounts and extras at our local gastronomic restaurants and leisure facilities. Bed linen and towels are provided, Wi-Fi, electricity, water and garbage fees are included. The bungalow is heated all year round and parking is available in about 50 m distance. New on offer: on request, you can borrow an Amazon Firefox TV Stick for a fee. Pets like dogs and cats are welcome, the cost is 6 € per night per pet. Accessories such as feeding bowls, dog basket, cat toilet, cat tree and cups are included. Towel sets (bath towel / towel) can be rented for a single 7 € per set. Visit our Bergnest Bungalow and be enchanted by its ambience and charm. Alternatively, we can recommend our modern apartment for a maximum of 3 adults. Final cleaning: once per object costs in the amount of 60 EUR (obligatory). Towels: to rent once per person for 7 EUR (compulsory). Visitor's tax / tourist tax: per object and per day costs of 1. 8 EUR (obligatory). Electricity: per object and day included in the price (obligatory). Pet: per animal and day costs of 6 EUR (optional). Wir haben die Zeit genossen! Meine Tochter und ich haben einen wundervollen Osterurlaub in der Saechsischen Schweiz verlebt. Das "Bergnest" war so, wie die Beschreibung auf der Webseite. Wir wurden sehr herzlich empfangen und es fehlte an nichts, um einen Urlaub mit voller Selbstversorgung zu verbringen. Im Haus hatten wir genuegend Informationsmaterial, um die einzelnen Ausfluege zu planen. Auch die Gastgeber waren sehr hilfsbereit. Wir koennen diese Unterkunft bestens empfehlen! Sehr gemütlicher Bungalow ruhig am Waldrand gelegen. Die kurze Strecke bis Gottleuba kann man durch den Wald laufen. Dort findet man alles was man braucht- inklusive eines schönes Cafés. Leider funktionierte die Heizung nicht durchgehend. Dafür konnten unsere Vermieter nichts, aber deshalb gibt es nicht die volle Punktzahl. Die Treppe hoch zum Schlafraum ist schmal und steil. War für uns kein Problem ist es aber vielleicht für Ältere. Alternativ kann das Schlafsofa genutzt werden. Internet (per object and day, included in the price 0 EUR). Parking (per object and day, included in the price 0 EUR).